We are pleased to present our Natural Stone Website. We are certain that you will find the photographs helpful in the selection and specification of our stones. The photographs in this site were taken to match the original stone as closely as possible. However, due to differences in computer settings and printer variances, these photos will vary in color from the original stone. We do not represent that the photos are an exact match of any of these stones. Always see an actual sample boards for true color before making any purchase decisions. As a major supplier of natural stone in the Western States market, we fully realize the importance of quality in both product and service. We anticipate being able to live up to your highest expectations. Please consider the following before you begin your selection process. Specifiers should be aware of inherent variations in color and texture because Natural Stone veins change on a daily basis, the enclosed photos represent what was mined prior to your project. We highly recommend a sample panel from existing quarry inventory be built at your job site and approved prior to shipping the project. It is our intention to supply you with adequate samples, current job photos, if requested, and up-to-date pricing. Use constitutes acceptance of materials. Materials are considered accepted when the installation process begins. This item is Non-Returnable for any refund. We do not guarantee color, match or structural fitness. Stone is sold in an "as is" condition" with no warranty of quality. Once removed from our truck or loaded on your truck at the quarry, the stone is considered accepted in good condition and our standard payment terms go into effect. Due to factors, the square foot coverage per ton of stone will vary with each job. We do not guarantee any coverage per ton on natural stone. Coverage is affected by the average stone thickness, type of stone, size of joints, usage of various size pieces, waste, etc. Any discussion a staff member has had with you or any coverage guide we have supplied are or were supplied as a guide, are to be used for a guide line only. You, as the customer, are fully responsible for your project needs. We will deliver the quantity of material you order with no guarantee of coverage. As a general rule, Lompoc Stone is not available without the blackheart, except for the natural ledger (laid with the natural face out) as it is all natural edge material. The dark after exposure to sunlight to a soft light contemporary gray color. Please allow us to sample the dark just out of the ground and some that has been exposed to sunlight for a period of time. Any questions regarding the acceptability of these products must be resolved prior to installation. NO ADJUSTMENTS WILL BE MADE AFTER INSTALLATION. Please contact our company's management staff if you, your client or your installer have any questions or concerns with regards to acceptability of the product or concerns about any aspect of the product before any installation takes place. Variations in color, size, and texture are inherent in all our products. Use constitutes acceptance. No returns on all natural stone products. Please have property owner and or builder/designer inspect all materials for correctness before any installation takes place. Seller does not know or have reason to know of any particular purpose for which the buyer requires the goods and does not represent goods shall be fit for any particular purpose. Buyer is not relying on seller's skill or judgment in the selection or installation of goods. Lompoc Quarries shall not be liable for any failure or delay of performance due to causes beyond its control, including, but not restricted to: acts of God or the public enemy, floods, fires, earthquakes, hostilities, war (declared or undeclared), acts of either general or particular applications or any de jure or de facto government or any of its subdivisions, bureaus or agencies, strikes or other labor troubles whether direct or indirect, riots insurrections, civil commotion, loss or shortage of labor, transportation, raw materials or energy sources or failure of usual means of supply. After setting stone, keep stone moist for a few days to help slow down curing process. We strongly recommend the use of acrylic admixture at a ratio of a minimum 50% admixture and 50% water per batch of bedding mud. All this will help ensure against stone popping up from base material. For any cause whatsoever, whether beyond Lompoc Quarries' control or not, Lompoc Quarries liability for failure or delay in performance shall not include incidental and consequential damages. 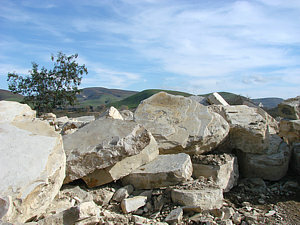 Return the used pallets to our Lompoc Quarry when you pick up your next load of stone. We will credit your account for the full amount of deposit.